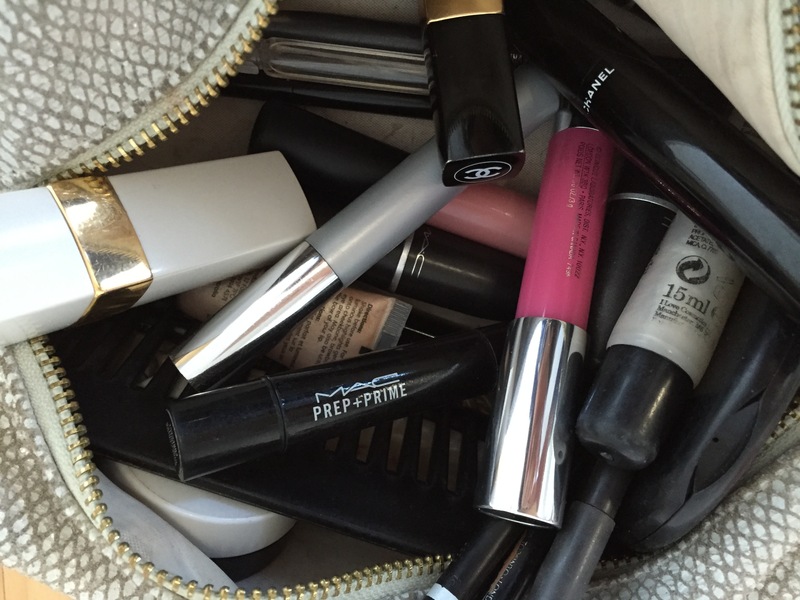 My over-flowing Make-up Bag – What is Style? I lug my Kookai make-up bag with me to work every day. Occasionally I think to open it when my lips start to feel dry and need a smattering of my Chanel lip-balm or Mac dusty pink lip gloss. The thought never occurs to me to comb my hair, despite the fact I often look windswept in a bad way, but choose to do nothing about it!! Firstly I moisturise my face with a mixture of ASAP and Priori beauty products from Beauty on the Strand so that my skin is well hydrated and looking fresh and clean before I apply on any of my make-up. Mac Prep + Prime is currently the product I use (in a vain attempt to cover up my bags) under my eyes. A whip of my waterproof Clarins mascara which wipes off in a breeze, and is perfect for ensuring no panda eyes. A dab of bare minerals bronzer on my cheeks (why I do this, I have no idea) as my cheek bones are well evident. I think in wintertime, it adds a bit of colour. Yes, a quick brush of the hair and occasionally a use of my GHD straighteners to get rid of those annoying wispy bits and off I go. To be honest, I spend more time putting my outfit together than on looking after my face. I really don’t have a clue about how to put on makeup. 2 lip glosses; 2 lip pencils; 1 lip balm; 1 glitter gloss; 1 precision eye-definer (whatever that does); 3 lipsticks; 1 comb; 1 mirror; 1 make-up brush; 1 highlighting cream; 2 mascaras; 1 beauty-flash balm; small bottle of perfume; packet of tissues, hairclips; hair-ties etc. It weighs a ton. I feel so secure with having it near-by just in case. However what I really need to do is de-clutter. Do you? Absolutely love the make up bag, Yellow Tulip! You sound perfectly organised; nothing wrong with that! You never know when you may need an extra splash of make up in a day time. I just need to get with applying the make-up that I do have. Thanks for the tutorial around how to use liquid foundation. I haven’t yet been game to try but definitely will. It was great to visit Beauty on the Strand to get the helpful hints. Sounds like you have perfect organisation for your work routine. I have something similar although generally decide on the morning now, what I feel like wearing. I can’t stand those wispy bits of hair so the straighteners have been used a lot lately. Doesn’t help need a hair cut. Hope your neck and shoulder are getting better. Would be keen to know what you think about your mineral powder and which brand that you use. I really like mineral powder and had been using bare minerals until recently. I now use Bella Vi which is just amazing and nice for a change.